Made in the USA. Ohio Stoneware utilizes a proprietary clay for producing their stoneware. The crocks are fired at approximately 2,200 F using traditional kilns and undergo an 18-hour heating and cooling process. Craftsmen and craftswomen hand finish each piece with a food safe, lead-free glaze that will not absorb odors or flavors and prevents leakage. This process provides strength, durability. and provides for easy cleanup. 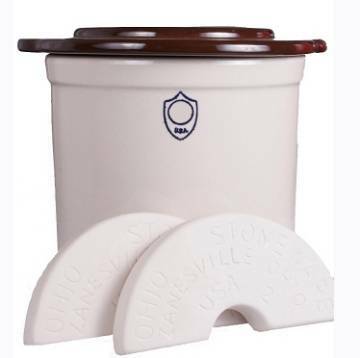 This 2-gallon stoneware crock uses age old methods for fermenting and preservation. This style crock does not use a water channel, but has a lid that covers the full top of the crock. Enjoy fermented produce of all types while ingesting all-natural Probiotics. 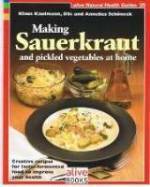 Ferment cucumbers/pickles, cabbage, root vegetables, beans, pepper, olives and much more. You can even make home-cured corned beef, salami or pastrami. Even try grapes for wine.